It’s common to see similar trends in story writing, especially when they are from a similar generation/time-period. The common traits, either help define the current state of the creators and their surroundings, or it could just be an explanation of what is currently of most interest, most noticeable, to you as a viewer. Last year my Anime + Manga consumption was limited, but the three biggest things that stood out was Attack on Titan (Season 1 of the anime), Naruto (been just reading it for years, too late to stop now, haha), and the last show I watched last year, which was an older one from 2007, Gurenn Lagann anime. This post talks about the recurring theme that I saw in the three shows, which mostly center around Humanity and two major forces working for it, but against each other. Spoiler Alert: The following post will contain spoilers for Naruto (Manga Chapter 661), Attack on Titan (Season 1 Anime) and Gurren Lagann (Complete Anime). Let’s start with the Moon’s Eye plan in Naruto that was revealed almost 2 years ago. As the chapters progressed and the-man-behind-the-man-behind-the-man, Uchiha Madara once again explained the details of the plan and his reasons, it brought forth the always existing ambiguity of “So who’s the Bad Guy?” that Naruto series has made the viewer ask multiple times. Uchiha Madara and the first Hokage, Hashirama Senju, were friends as kids and they both wanted there to be peace and harmony amongst humans. Hashirama thought that there would be a way to achieve that by making people talk to each other and destroy the hatred among them. Madara, through his life’s experiences, thought that no matter what happens there is something within in humans that will always make them hate the other and fight, hence creating an endless life of conflict, death and misery. These two opposing views created the biggest divide in Naruto-verse and went on for centuries. Here come in the details of Madara’s plans, he plans to cast a huge genjitsu that will will project itself from the moon and make it such that all humans are controlled by Madara’s will and he will make it such that no two people hate each other, and there is no more fighting in the world. When this spell occurs, all humans would be in a vegetative state with their minds trapped in genjitsu and thinking of themselves as living a happy life. Of course, the Manga doesn’t go too much in detail by telling what would be done about aging and population etc etc, but the basic idea is that Madara has fallen into despair and thinks that there is no future for humans because the very fact about humanity is that there will be a continuous conflict among groups, no matter which angle it is seen from. He forms a group of destructive people, Akatsuki, just to reach his goal of preserving humanity, he (and Obito) “gives up his humanity, to save humanity” in a way. Naruto, the hero of the story, believes what Hashirama believed. First of all, the fact that all humans would be vegetative and not have free will is basically “loosing humanity” and that it would not be a life worth living, is as good as death. He has Hope for humanity that they can fill the holes in their heart by finding friends and love, and in such human compassion, is where eternal peace is found. He does not have a solution to how he would stop all the deaths and fighting, what he believes in is that with love and hope, humanity will find it’s answers as time comes. The Second Hokage also says a similar line in Ch 661 where he retorts to Madara that he “wants to dream” and that is what humanity is, not the dreamless, lifeless solution that Madara has thought up of. “Humanity” is probably the most used word in Attack on Titan, it is clear from the start that the show is going to be way more raw with it’s theme and message, compared to Naruto . The basic premise is that all of humans on earth are now living among three concentric circles. The Circles are huge walls that have existed for a long time and the class-hierarchy of the population goes higher as you approach the inner circles, with the center being where the top politicians and leaders live. There is a line that Commander Dot Pixis tells the hero, Eren Yeager, something of the sorts that long ago humans roamed the earth freely, there were no walls, but all humans were at war against each other. He says something on the lines that there was one line of thought, that claimed that if there was a unified enemy to fight, all humans would set aside their differences and fight that enemy and would be at peace with other. The premise is very similar to what Madara is planning. The Moon’s eye plan, similar to the plan to keep all humans among walls, reduces the freedom of humans, instead of reducing humans to a vegetative state, humans are reduced to mere cattle in Attack on Titan. This is where the Eren’s ideology starts to form, he thinks that humanity is about being free and roaming the earth and crossing the seas, conquering mountains. Waiting inside the walls, like cattle, just waiting for the Titans to break-in and eat people as food is not acceptable to him. There are many forces within the walls who think what they have right now is the best possible solution and that they should make the most of it, and that Titans attacking and eating people is just the price to pay for a comfortable life they have rest of the days. No matter how much in-fighting within the organizational structure of the Walls among the politicians, military etc, everyone still thinks that their enemy is all that is against Humanity, i.e., the Titans. Even here, many realize that their way to fight for humanity, is by giving up their own humanity. Armin and Eren seem to realize that very soon. Also, Mikasa starts off by falling in despair but finds a friend in Eren who fills the void in her and gives her hope. 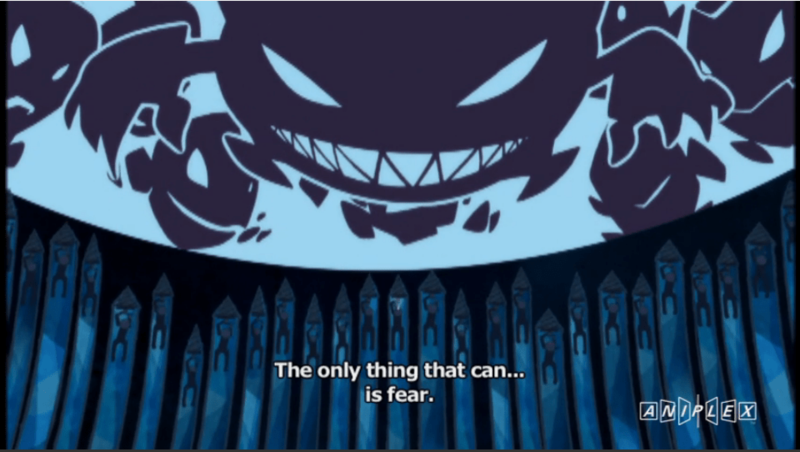 This is basically a starting situation where despair had won, seeing that humans will always strive to expand and conquer, someone who had a despair filled view like Madara probably executed the plan of the Titans and the Walls so that humans would find a way to be self sustained and not reach the potential of imploding onto itself. 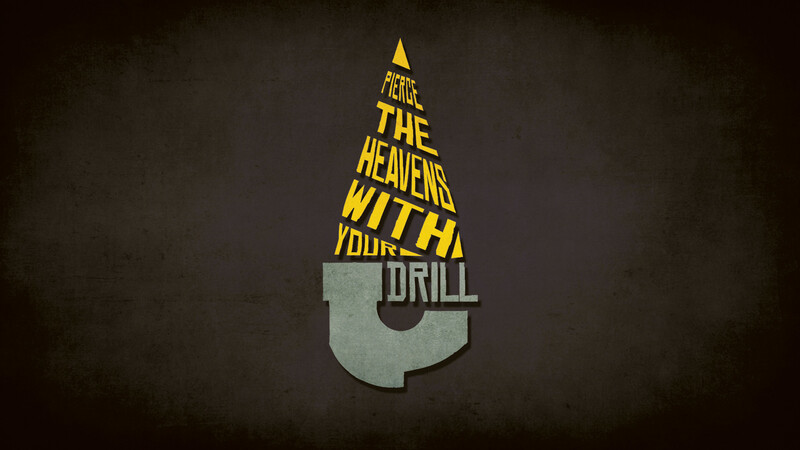 The Spiral Drill of Humanity. Enter Gurren Lagann, a story that starts off very similar to that of Attack on Titan, all humans are living under-ground, there are only few who even think of imagining a world outside, a world with no roof. Kamina and Simon are the heroes and they are seen dreaming 0f an outside world. The leader of the village is similar to that of the politicians of the walls in Attack on Titan, he suggests that they stop thinking about going outside and enjoy what life they have here underground… live there and die and always live in fear of earthquakes. Right within the first episode, Simon and Kamina find themselves going to the top after a fortunate turn of events, and then they learn that at the surface there are Titan-like huge Mechas that kill all humans that are visible above surface. Their purpose and reason is not understood at first, just like the Titans, only thing they do is go around and kill humans. Eventually the heroes reach the main King that is controlling all these Mechas ordered to kill humans, and they defeat him. He leaves them with a warning that once the number of humans above earth increases over a million, the moon is going to do something. Through a series of events it is revealed that the moon was programmed to be like a monitor that would check for the number of humans above the surface and all humans would be eradicated once it is observed that there are more than a million humans living. Now begins the phase of the show where questions are asked and the characters try to understand why there would be a force that wants to kill humans. The way the show reveals it is by saying that humans are a type of species that carry the SPIRAL within them, it is in their DNA (double-helix etc). The spiral tendencies in them makes them want to keep conquering and expanding and changing with the world, which means that eventually they would engulf the whole universe and this would make the universe implode on to itself and remove everything from existence. The only force that can push-back this innate urge to grow within spiral species is “fear” ( as explained by the anti-spirals, etc). In order to emulate this fear, the Spiral King created the Mechas and cultivated humans inside the earth, so that they could be preserved and not be wiped away like the anti-spirals intended. Making the Spiral King an indirect good-guy, but one who had fallen into despair by looking at the eventual future of the world as explained by the anti-spirals. 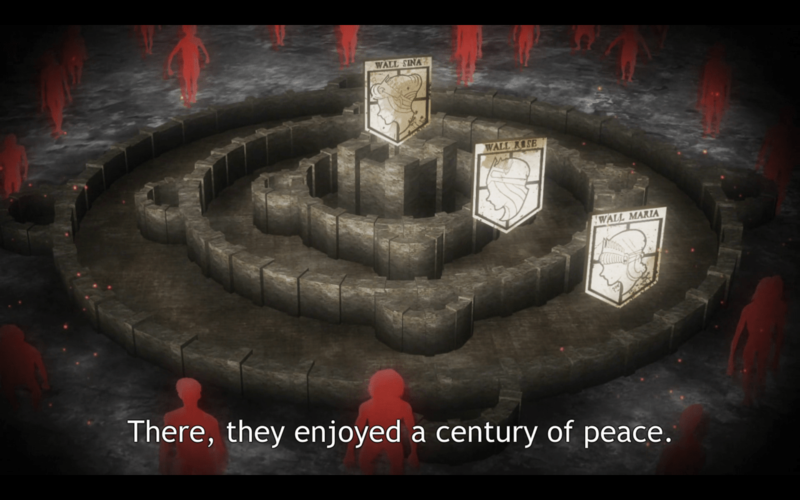 The Spiral King basically created the Walls of Attack on Titan, he was that guy who had this view that containing humans in confided space and limiting their growth through fear of life is the way to save the world. They eventually reach the main anit-spiral villain who explains that they were also a spiral species previously, they had realized that the only conclusion of this would be that all life would cease existing. What the anti-spirals decide to do is to go into an eternal state of meditation and stop their growth permanently, while leaving one of their highly-realized beings alive along with automated machinery that would keep tabs on the spiral species of the world and prevent any outbreak. He believes that the constant growing and changing nature of Humanity will overcome whatever problem it will face, when it faces them, a very hopeful outlook. It is similar to what Naruto says to Madara, also is what Eren wants. Imagine walking on a spiral path, where at every step you think you know where it leads to, but after every step along that path, the endpoint changes. (similar to a reversing car with fixed steering angle). This is how Simon claims that change is the only constant and why he believes in constant evolution and has hope. He calls out the despair filled view as something that is the anti-spiral’s limitation, and not something that it should enforce on others. All these major series have Humanity and it’s future at the crux of it all, it could be because that is what is in the mind of most creators, or it could be because the masses find solace in looking for hope. When shown in a way that they are more aligned to (anime or manga) they perceive it way better than being say, forced to think that way. 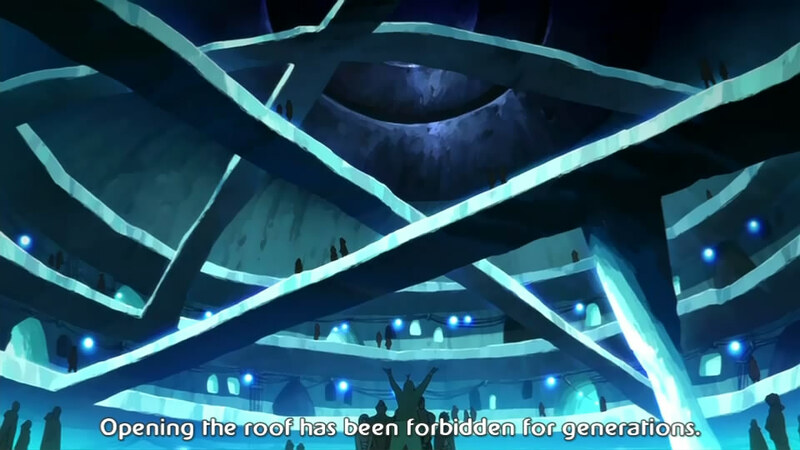 Gurren Lagann is filled with pseudo-science explanation for almost every supernatural thing that happens in it. More than it’s silliness, it shows how well even the most magical can be made to seem logical. At some point it all might start sounding like some religious doctrine, but the shows try to communicate the theme of Humanity, the pros and cons of Hope and Despair by sprinkling them with familiar anime goofiness and impossibilities. All three of them also try to show the evolution of human communities into forms of government (The elders of Konoha, Elite of the Walls, Rossiu’s new government), fundamentalism (Adai village, Worshipers of The Wall) and their internal problems. It’s like they are trying to show their audience something, all the despair that exists and how to find hope, all for Humanity and it’s future.